Halloween is fast approaching, and whilst this holiday is a joyous time for children and adults alike, the spooky season is also the perfect opportunity to get creative with your embroidery. There are so many wonderful and weird creations that can be born from this, the most spine-tingling spookiest of months. With the weather is getting colder as the nights grow longer, the urge to have something ghostly/witchy/creepy in the home is strong. Whilst all the shops will be stacked high with cheap, easily-broken Halloween-themed tat, take the opportunity to, instead, create your very own Halloween décor and wearables this year. If you have your own embroidery business, or are simply an embroidery enthusiast, Halloween is the perfect time to put your talents to good use and create some amazing Halloween goodies to help everyone get in the spooky spirit. Whether it’s to sell or simply to help your own little monsters (or if you want to dress up this year yourself, you’re never too old), embroidery is great for Halloween costumes. Costumes are everywhere in October, online and in every high street shop imaginable. But these shop-bought costumes are often very poorly made and never look anywhere near as good on the buyer as they do on the model on the box. Instead, use your embroidery skills to create your own costumes, or add elements to existing ones to give them a personalised edge. Whether it’s a tailored design on a witch’s cape or adding delightfully ghoulish patches to the jacket of any costume, or even just adding some final details to a costume for a film or TV character, embroidery can really liven up any Halloween costume. In addition to costumes, shops will be absolutely crawling with Halloween décor of all manner, from ghostly ornaments that will sit on a shelf for a week or so only to be lost somewhere in the attic by the time Halloween rolls around again, to cheaply made table coverings and hangings that feel awful and artificial. 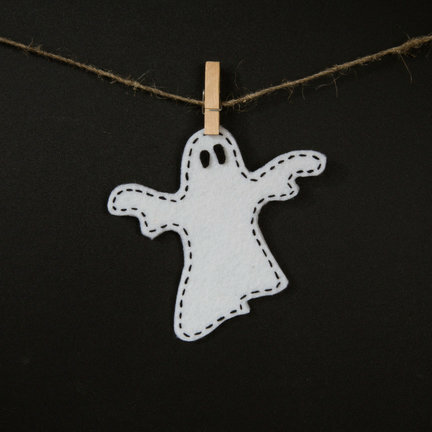 Break out that embroidery machine and create your own Halloween decorations. There are so many ways to get creative with embroidered decor; consider stitching some creepy crawlies onto innocuous looking linen, or perhaps creating a Halloween-themed table topper or embroidering some spooky messages in frames to hang around the home. For something a little different, why not try your hand at creating a gothic, lace chandelier? Using some freestanding lace, you can craft your very own 3D chandelier for that next Halloween party. With just the simple addition of glitter and some adhesive, you can create a gorgeous, sparkling ensemble to hang right over a buffet table or entryway to give houseguests a spine-chilling welcome. Another great idea is making Halloween-themed pillow wraps. You can really let your imagination go wild and create any design you fancy. Whether it’s a classic black cat and witch motif or a more specific Halloween character like Jack Skellington, you can have free rein with the design. The advantage of the pillow wrap over buying a Halloween pillow is that, when Halloween has passed, they can be stored away for next year and those pillows can go back to their non-spooky selves for the remaining non-spooky months. Probably the most exciting element of Halloween for the little ones is, of course, trick or treating. Whilst shops will be overrun with plastic pumpkin-shaped tubs and felt bags with a generic Halloween image on the front, they certainly don’t make particularly interesting additions to most children’s costumes. Children will love a customised trick or treating bag to match their specific costume. You can add embroidered patterns to a plain bag or create the bag from scratch. Like with the pillow wraps, the designs can be whatever you want. You can customise them to add an additional element to a child’s costume, such as a bag completely covered with embroidered spider webs if the child has dressed up as the feared arachnid. This Halloween, show off your embroidery skills with some truly eerie creations. If you have your own embroidery business, and you’re looking for embroidery accessories, look no further than Stocks Embroidery and Sewing Solutions. Feel free to get in touch with us today, and a member of our team will be more than happy to assist you.